Today Kamal turns 58. 53 of these 58 years he has been (and continues to be) an actor! That in a nutshell sums up the reverence that Kamal Hassan has for the craft of cinema. His body of work is very unlikely to be surpassed by any of the contemporary actors.While adhering to the demands of commercial cinema, Kamal somehow manages to make space for creative freedom to essay characters that are mostly tortured, unsympathetic, larger-than-life, created with the help of a tiny club of A-list directors like Balachander (Apoorva Ragangal), Bharathi Raja (Erra Gulabilu), Mani Ratnam (Nayakudu), K Viswanath (Swathi Muthyam), Balu Mahendra (Vasantha Kokila) and Bharathan (Kshatriya Putrudu). His risky choices continue to pay off off not only on the awards circuit — he is by far the most decorated actor in terms of awards in the history of Indian cinema — but at the box office as well. He has appeared as a dwarf (Apporva Sahodarulu), buck-toothed, pot-bellied baddie (Indrudu Chandrudu) and even perfected a hernia walk in 16 Vaithynilae (as Chappani). The last one was very early in his career. Many called it madness. It sure was. With Kamal, though, there was always a method to it. His risk taking is cheered by an ever growing contingent of Indian cinema buffs, who over the years have deified him for his willingness to make the kind of movies that most stars would not even think of. But Kamal is not like most stars. SRK, during the shooting of Hey Ram, said that he felt like he had enrolled in a one-man film university. “It is a privilege” SRK remarked, when asked about his experience working with Kamal Hassan. It is ours too, watching you entertain us. 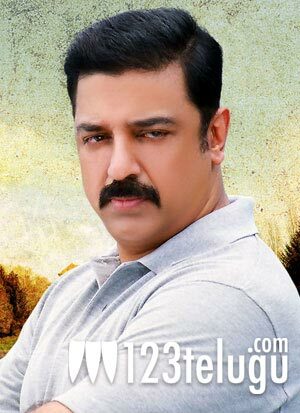 123telugu.com wishes Kamal Haasan a Very Happy Birthday!